People who attended the Value Voters Summit that President Trump addressed on Friday said they were greeted with anti-LGBT pamphlets that were reportedly distributed at the event. 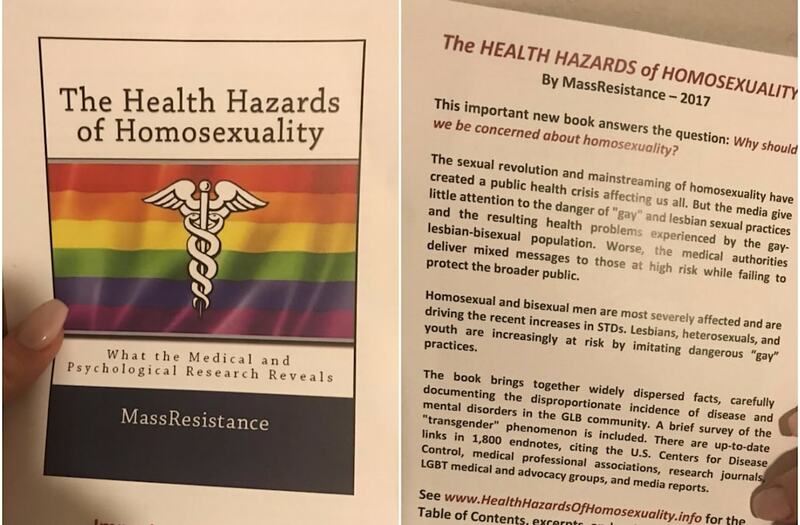 Pictures of the booklets allegedly handed out at the event appeared to feature insights from the book, "The Health Hazards of Homosexuality," authored by the Mass Resistance, a longtime anti-LGBT hate group based in Massachusetts, according to the Southern Poverty Law Center. The material included in the booklet, which warned readers of the "public health crisis" created by homosexuals, has earned a swift reaction from Twitter users who have condemned the president for speaking before the Value Voters Summit, despite it also having been deemed a "hate group" by SPLC. "Trump, who vowed to be a friend to the LGBT community, will speak to a group warning that homosexuality has created "a public health crisis," one user tweeted. "Trump is honoring a group that tells guests disease & mental disorders are rampant in the LGBT community, & endangering the broader public"
Some were quick to criticize Trump, who is reportedly the first sitting president to address a classed anti-gay group's "values" conference. I am deeply concerned by the Trump administration’s hostility to #LGBT rights. But many supporters have also rushed to Trump's aid, defending the president's choice to speak at the conference hosted by the "anti-gay" group, despite him having portrayed himself as a "real friend" of the gay community in the months leading up to the 2016 presidential election. Let the liberal triggering begin! Trump speaking right now at the Values Voters Summit!!! Among the handouts distributed at the Values Voter Summit attendees also received was a flyer urging a boycott of the Super Bowl. Trump to speak at Value Voters LGBT hate fest. How do you feel about that @ChrisRBarron ? Still cheerleading for him? Why are "value voters" clapping for President Trump's gutting the ACA? What values do these people have? @rudepundit Trump "value voters?" The effing moron speaking to the oxymorons. President Trump's speech at the Value Voters Summit was pretty remarkable. I think he really hit everything on the nail.